It’s time for the sixth annual Thanksgiving Day Turkey Trot. This free community fun run, walk or stroll will take place at 8:30 a.m. at the Lassen Superior Court at 2610 Riverside Drive in Susanville. The Lassen Senior Center will be accepting donations of non-expired, non-perishable food items and checks made payable to the Lassen Senior Center at this annual fundraising event. For more information, call 310-5013. Susanville Assembly of God church wants to extend a blessing to the community by hosting a free Thanksgiving Day turkey dinner with all the fixings. The dinner will be held at the church on Richmond Road from 11 a.m. to 2 p.m. If you don’t have family or friends to join for the day, be sure to accept this heartfelt invitation to share a meal and fellowship. The Bottle and Brush Art Bar has put together some great specials on gifts and unique one of a kind art items for their special Black Friday and Small Business Saturday event going on from noon to 5 p.m. Friday, Nov. 23 and Saturday, Nov. 24. You’ll find specialty body and bath products, kitchen towels, jewelry and a great selection of paintings by local area artists. See their ad for more information on their special discounts and be sure to stop in and sip their premium wines, do some shopping and save on holiday gifts. Melissa McCoy at Every Bloomin’ Thing tells us on this Black Friday, Nov. 23 and Small Business Saturday, Nov. 24, the first 25 people both days will receive a free gift. The gift shop is bursting with new holiday gifts ideas for everyone on your list from knit hats and gloves to beautiful decorations a real must see. Go to everybloomin.com for a complete list of all the holiday make and take classes. 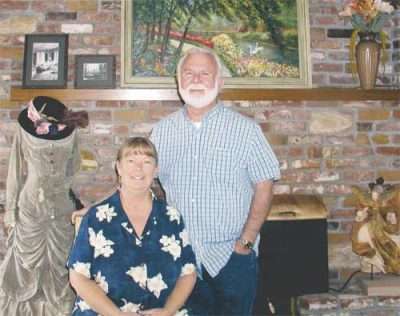 Robert and Linda Hart, former owners of Little Norway Resort and the Coventry Gardens Restaurant in Susanville, have taken over the restaurant inside the historic Walker Mansion Inn in Westwood. Using the same name as they did in Susanville, the Coventry Gardens Restaurant, the Hart’s are inviting guests to “Celebrate Fall with a Fall Tea” on Sunday, Nov. 25, with two seatings, 3 p.m. and 5 p.m. There is a fixed price for adults and for children that includes soup, quiche, tea sandwiches, savories and desserts — and, of course, the freshly brewed tea. Reservations required: 258-6559. On Saturday, Dec. 1, the Artisan Coffee & Gallery in Janesville is holding its annual Friends in Art Country Christmas show from 9 a.m. to 3 p.m. You’ll have a chance to meet the local artists and get great deals on handcrafted items for those special people on your gift list. Some of the items include natural stone necklaces, ceramic plates and figurines, stained glass, metal sculptures, lamps and much more! On Dec. 8 and Dec. 9, the Susanville City Kickettes is performing its Christmas Extraordinaire at the Veteran’s Memorial Hall in Susanville. As always, this performance features the JandJ Dancers from JandJ Performing Arts Studio. Advance tickets are available at JandJ Performing Arts, Margie’s Book Nook and Zaengles Furniture. For more information, see their ad in this week’s paper or go to jandjperformingarts.com. Esther Faustino, owner of El Tepeyac Grille and Lassen Steaks in Susanville, is thankful that she has had the opportunity to serve the people of Lassen County over the last 13 years. As she celebrates her 13th anniversary in Susanville, Faustino expressed her sincere gratitude for the friendship and goodwill she has found with her customers. El Tepeyac Grille and Lassen Steaks is located at 1700 Main St. in Susanville.